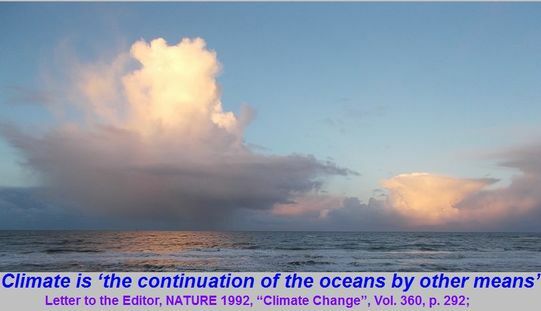 "CLIMATE IS THE CONTINUATION OF THE OCEANS BY OTHER MEANS"
see: NATURE 1992, “Climate Change”, Vol. 360, p. 292; http://www.whatisclimate. but science cannot say what it is! because climate means anything and nothing? hampered by the use of words without fixed signification"
For years, one can hear it daily. Climate change is the greatest threat facing our world. Few declare the debate as hoax, like U.S. President Donald Trump, others regard it as real, respectively as an issue that affects the whole of humanity, the future of humans depending on it. As long as only the rise of local or global air temperature is viewed, this is certainly correct. But that is rarely the case. Overwhelmingly all refer primarily to a threat by climate change, which is a distinct issue from a rise of air temperatures. Indiscriminating use of both term simultaneously is a fretful failure, leading to misinformation, disguising, and, if intentionally, a gross delusion. In the way science has been using the word climate over the last decades, the general public and politics is misguided since long. The reason is that science has been incapable to demonstrate that they understand what climate is, and able to define the terms they work with. Actually they use a layman term, broadly understood as average weather (for example the summer season in Florida), as greatest threat facing our world by calling it “climate change”. That is irresponsible and in an objective sensedelusion. 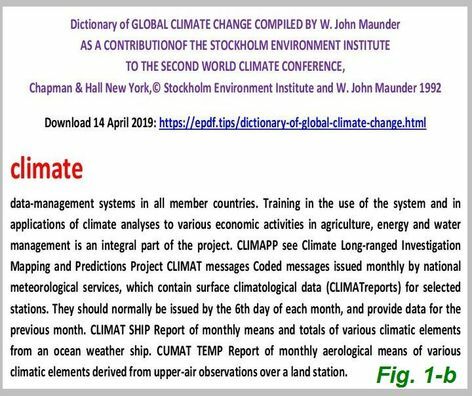 Let’s have a look at the term climate as used by science and climatology. Summing up the distinction between short-term changes in the weather and long term climate trends ……, Dr. J. Marshall Shepherd, President of the American Meteorological Society, used nine simple words: "weather is your mood and climate is your personality." Nothing is explained with such comments. They cause confusion and are nothing more than babble. 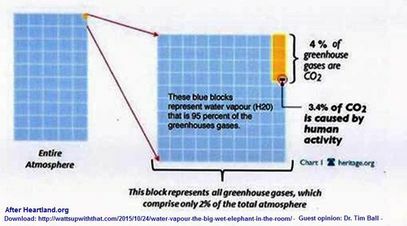 That stems from the fact that weather is a physical state of the atmosphere, and climate merely the numerical statistic of numerous aspects of this state. While the former situation exists for a very short moment only, never repeating again, the latter is a huge amount of numbers and can never convert to weather again. It is therefore horrible when it is said: climate affects weather. How can any statistic influence the physical condition of the atmosphere? Unfortunately, this is not just a slip-up, but runs through all the definitions that science uses for weather and climate. 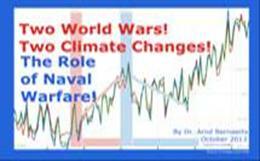 Since modern climatology claims to be abler to advise the general public and governments on climate change since about the 1980s, their ability to formulate what they are talking about was remote, if existing at all. Let’s start in 1992, before discussing briefly the background of the term: climate. This definition is in no way a substitute for the gap left by the UNFCCC. Even the quality of the first sentence can be questioned, as subsequently “actual climate”, and other issues mentioned. The most prominent institutions on climate are the Intergovernmental Panel on Climate Change (IPCC) and the American Meteorological Society (AMC). Today they have both lengthy glossaries with more than 12,000 terms (AMS), or over 52 pages (IPCC) respectively. Remarkable - they are both concerning the term climate. On one hand, they differ extremely from each other. On the other hand, each text on climate is at best a joke as an academically reasonable definition. They are both useless in the field of scientific work, and of such big lack of clarity that they undermine any fair and explanatory communication between the general public and politics. 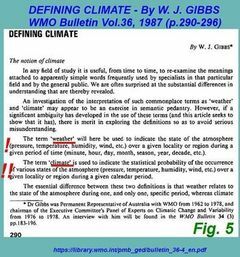 The IPCC definition starts with the confession that there is no better idea than to repeat the layman expression since ancient times: climate is average weather. (see Fig. 3). 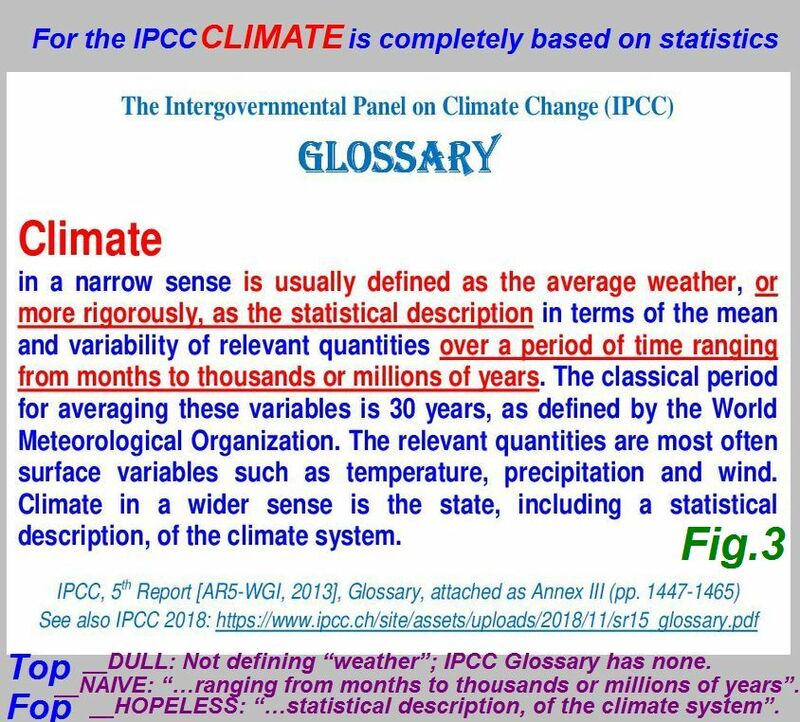 At least one would assume that the IPCC Glossary would tell the reader now what is weather, or how average weather is defined, but the Glossary is completely silent on it. The subsequent attempt to describe climate (more rigorously), as the statistical description in terms of the mean and variability of relevant quantities over a period of time ranging from months to thousands or millions of years, can only be called as naive. What “terms of the mean and variability” shall be used? What are relevant quantities? The text of the definition lose any ability as a working tool, when the so called ‘classical period’ 30 years is replace by a range ‘from months to thousands or millions of years’. Such a definition is completely useless, which commence with the use of the word weather, which is primarily an individual impression and experience of any person alive, and there are many. Weather is the state of the atmosphere over one given region during one given period (minute, hour, day, month, season, year, decade, etc.). ___A simple definition of climate is the average weather. ___A description of climate over a period (which may typically be from a few years to a few centuries) involves the averages of appropriate components of the weather over that period, together with the statistical variations of those components. ___The driving force for weather and climate is energy from the Sun. 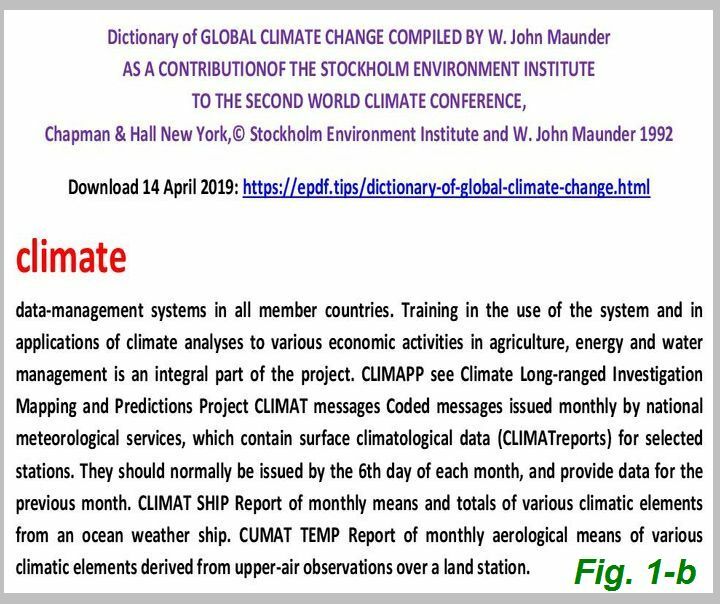 Although there is frequently a reference to weather, the Introduction (as presumably the entire Report, total pages 365) offers nothing, as the current IPCC Glossary. In the published edition by J.T. Houghton et al, 1990, Cambridge University Press the cited text is on page xxxv & xxxvi. Almost 30 years later, nothing has changed for better. A layman term was abused to scare the public than, while no effort was spared to increase the pressure ever since. 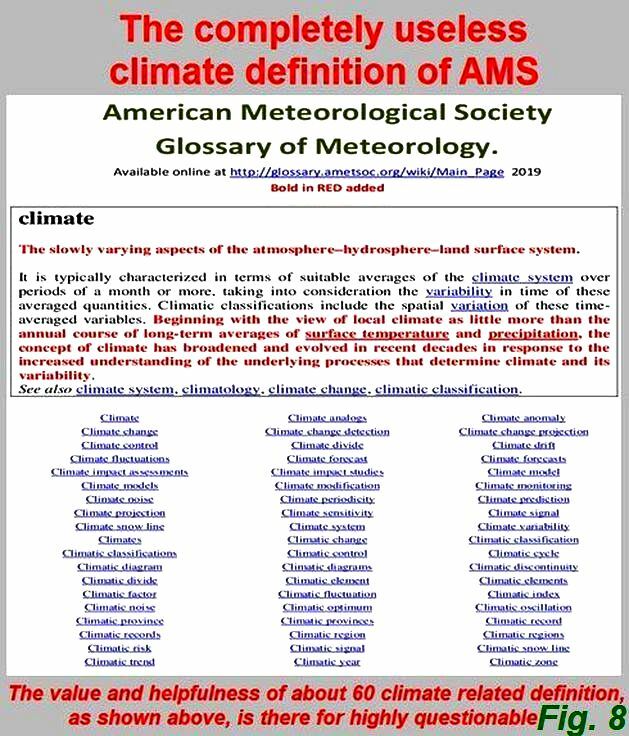 For more, see the following discussion about AMS definition on climate and weather. The system, consisting of the atmosphere, hydrosphere, lithosphere, and biosphere, determining the earth's climate as the result of mutual interactions and responses to external influences (forcing). Physical, chemical, and biological processes are involved in the interactions among the components of the climate system. Also the next about 70 words contribute little to make the term a reliable asset. 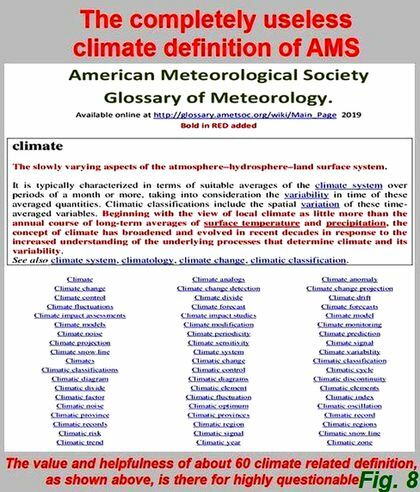 The only interesting aspect is, that the AMS climate definition back off using such terms as ‘average weather’, ‘statistical description’, or ‘relevant quantities’, but explains nothing, and says practically the same as the explanation of the ‘climate system’. As distinguished from climate, weather consists of the short-term (minutes to days) variations in the atmosphere. Question: Where is the 1st and 2nd sentence compatible? Popularly, weather is thought of in terms of temperature, humidity, precipitation, cloudiness, visibility, and wind. Question: What has this distraction (popularly) to do in a scientific definition? On the other hand, it confirms that also “weather” is primarily a layman term. The "present weather" table consists of 100 possible conditions, with 10 possibilities for "past weather"; both are encoded numerically. This shows evidently that also AMS has no definition of weather, but uses the word as it fits best. Five conditions here, 12 conditions there and thereon called climate. But weather is weather and cannot consist one time of 100 conditions, and if convenient for making a case consist of 3 conditions. Not surprisingly “future weather” is not mentioned. The concept of climate can be found in Greece in fifth century BC. To Hippocrates of Kos (~460 – ~370 BC) it comprised airs, waters, places associates season, prevailing winds, and the quality of the air and water with the physical condition of people. The earliest notions of ‘klimat’ were linked to sun inclination, and latitude. Over 2000 years the term climate is a solid public domain. Like weather, the word reflects a general impression. People not necessarily like to talk about climate and weather, but need to find out, which issues are needed to have an informative conversation, e.g. temperature, sun shine, rain, wind, etc. In countries with quickly changing weather conditions, as in Western Europe, the talks on weather are more intensive and lengthy, as in the Sahara with little changes. It is more abstract when merely seasonal conditions for a holiday abroad, for example in Morocco in May is of interest, commonly called climate. Climate influences the surface of the earth, and this conversely, in its conditions. This intimate mutual connection makes climatology and climatography appear as parts of geography, because they are essentially necessary to describe the surface of the earth and its changes. These ideas find their expression in the fact that generally the colleges and universities, climatology as a whole is treated in the geographical departments. Perhaps the dependent role of climatology may be attributed also to the fact that geographers have so greatly furthered this science. The general introduction presents climatology as a world science, and its international organization. 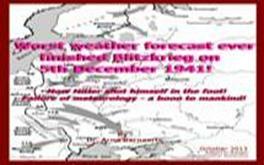 The number of observations in the meteorological register makes the necessity of statistical methods evident. · H.H. Lamp (Nature, Vol. 223, 1969): Only thirty years ago climatology was generally regarded as the mere dry-as-dust bookkeeping end of meteorology. 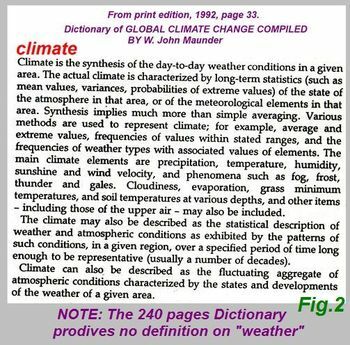 Definitions of climate and climatology have varied. That (still widely) definition of climate as “average weather” must surely be regarded as quite inadequate. Climate comprises the totality of weather experienced at a given place. · Kenneth Hare, (Bulletin American Meteorological Society, Vol. 60, 1979); This is obviously the decade in which climate is coming into its own. You hardly heard the word professionally in the 1940s. It was a layman's word. 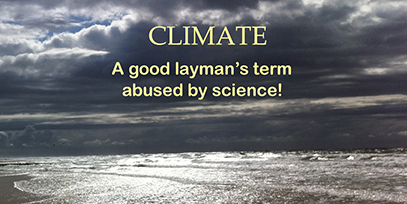 Climatologists were the halt and the lame. And as for the climatologists in public service, in the British service you actually, had to be medically disabled in order to get into the climatological division! Climatology was a menial occupation that came on the pecking scale somewhat below the advertising profession. It was clearly not the age of climate. Meanwhile efforts are made to present climate and climatology as a long standing interest of science, at least for the last 150 years. For example Roger G. Barry (in Int. J. Climatol., Vol. 33, 2013), is saying: “The term climate has a 600-year history, but only came into widespread use about 150 years ago.” The crux with such a statement is, that the entire assessment is based on the layman term: “climate is average weather”, which is “surely quite inadequate” as H.H. Lamp observed back in 1969 (see above). But still in 2019 IPCC rely on it (Fig. 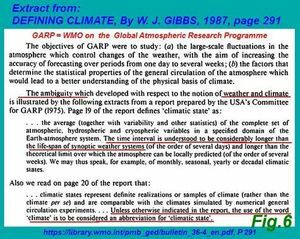 3), and AMS evade this point by talking instead of the ‘climate system’, see discussion above and Fig. 4. What should be the conclusion? A science which is not able to define in a clear and understandable manner, what they are talking about, does not deserve being recognized as a competent academic discipline. The use of words that are of 'emotional importance' to the public must be clear, reasonable, and comprehensible. Otherwise, there is a danger that it may come to an objective deception. The debate on climate change does not meet John Locks (1632-1704) requirements of using only terms with "fixed significantoin". while sticking to the fact that any statistic always remains a statistic! If one regards the words weather and climate primarily as an individual impression and experience of any person, respectively of emotional importance to the public, one should leave it in the public domain. Furthermore it seems most unlikely, that the terms can reasonably define in an academic manner, which would require a wording that does not mix-up with any layman understanding. But if the term Climate shall be used, not the weather but the oceans must be the centerpiece of the definition. Approximately 80% of solar energy intercepted by our planet enters the atmosphere over the oceans. About 50% of this energy flux reaches the bottom of the atmosphere after 25% has been reflected by, and 19% absorbed in the atmosphere. 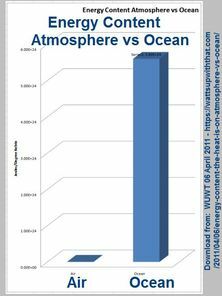 Neglecting atmosphere bias between continental and ocean regions, the oceans receive 40%, and the continents 10% of the intercepted energy. …The ocean is the principal initial receipiet of energy entering the planetary climate system…. The ultimate source in the planetary scenario is water, of which is only a very small percentage in the atmosphere. At any moment, the atmosphere contains only the amount of water, which would cover the entire surface of the Earth (land and ocean) with as little rain as one inch (2,5 cm) only. 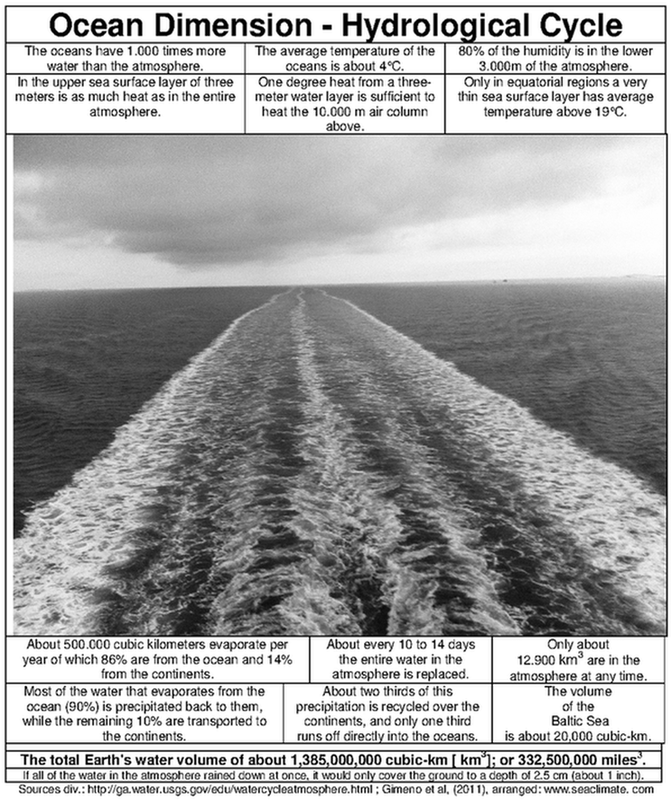 The water volume of the ocean is 1000 times bigger, and has only a mean temperature of about +4° Celsius. 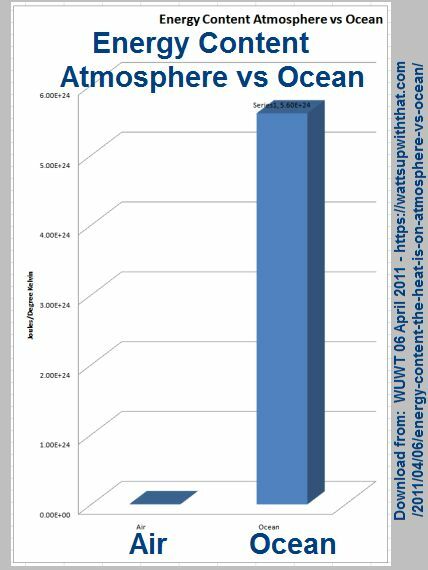 The huge stability of the oceans over long periods of time is amazing, but even minor change in current status of the ocean, will make the rising air temperature discussion any greenhouse discussion looking much too narrow. It is high time that any definition in this respect needs to acknowledge that the current and future planetary weather system depends on the oceans, or briefly: Oceans Govern Climate. and for sound scientific work. or more rigorously, as the statistical description in terms of the mean and variability of relevant quantities over a period of time ranging from months to thousands or millions of years. The classical period for averaging these variables is 30 years, as defined by the World Meteorological Organization. The relevant quantities are most often surface variables such as temperature, precipitation and wind. 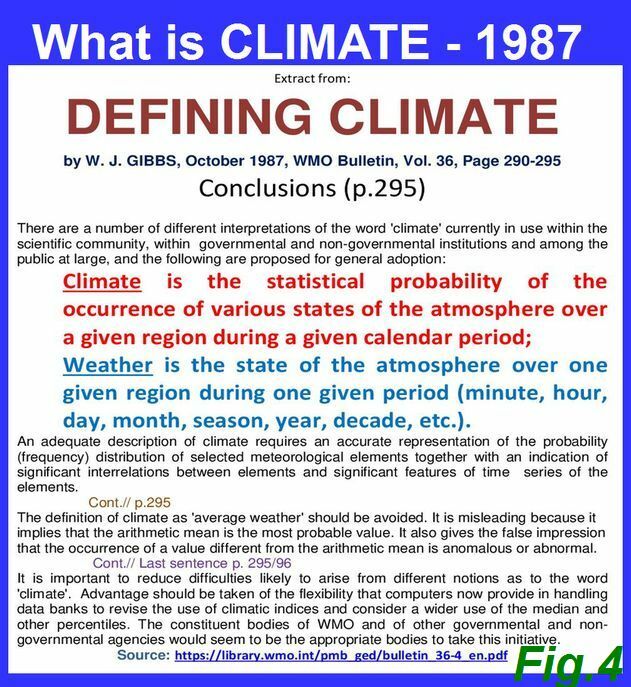 Climate in a wider sense is the state, including a statistical description, of the climate system. On the other hand it represents the state of climate science. Neither the World Meteorology Organisation or other scientific organisations or institutions use a different terminology. Is climate science incapable to define what they are talking about? 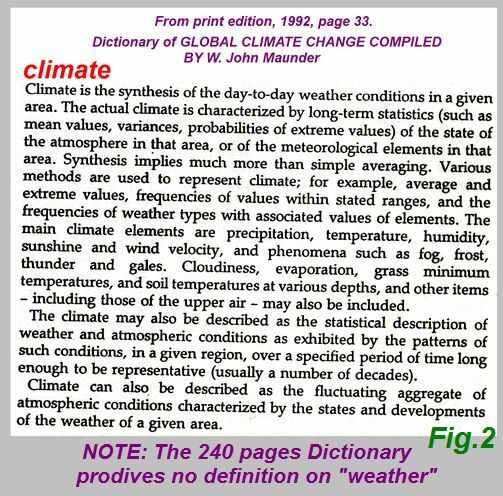 An analysis of the term CLIMATE as defined in the Glossary (left column) show big flaws (right column). What is CLIMATE in a wider sense? Is there any “unusual” CLIMATE definition? What shall “usual” explain? 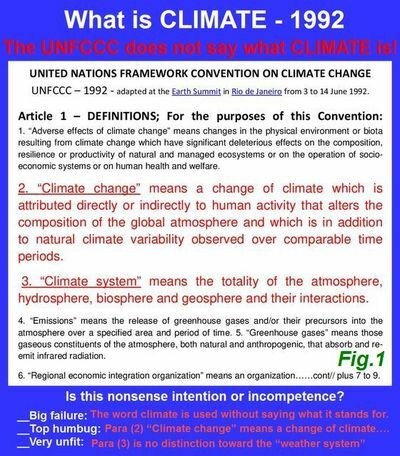 The term ‘weather’ is not listed in the IPCC-Glossary! The core term is not defined! Silly? A joke? ‘Weather’ presumably consists of up to several hundred parameters or descriptions. More details HERE, and HERE..
 ‘Weather’ is also a layman’s term since immemorial times, as described in the AMS-Glossary: “As the state of the atmosphere, mainly with respect to its effects upon life and human activities.” While it is a perfectly common term in the layman’s sphere, it is totally insufficient for scientific work. If the initial explanation ‘explains’ nothing (1-5), a more ‘rigorous’ approach explains either nothing. The word statistic is a quantity computed from sample data. A statistical description is a synonym of statistic. Once a statistic always a statistic. Which variability is meant? 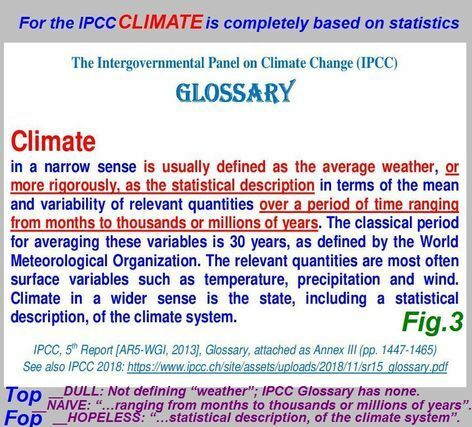 IPCC-Glossary cause confusion if saying: “Climate variability refers to variations in the mean state and other statistics (such as standard deviations, the occurrence of extremes, etc.) of the climate on all spatial and temporal scales beyond that of individual weather events. Variability may be due to natural internal processes with the climate system (individual variability, or anthropogenic external forcing (external variability).” Do they mean ‘weather variability’ or statistical variability’? Who defines what is a ‘relevant quantity’? over a period of time ranging from months to thousands or millions of years . What a flaw! How can science work with such nonsense? How can the general public and politics understand and evaluate ‘scientific findings’? Wrong, at least misleading! Only once the predecessor of the WMO agreed in 1935 that the period from 1901 to 1930 should be used to express departures from mean datax). Not only has this fixed indicator been abandoned, but also the time span of 30 years. What is now a ‘change’? What shall the word ‘surface’ indicate? The whole sentence is confusing and utterly nonsense. It actually says: “Climate is the state of the climate system”. 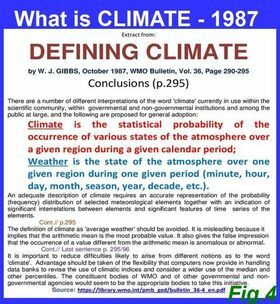 According IPCC definition, climate is statistic. Why do the authors include in the sentence: “including a statistical description”. IPCC-Glossary says: The climate system is the highly complex system consisting of five major components: the atmosphere, the hydrosphere, the cryosphere, the lithosphere and the biosphere, and the interactions between them. The climate system evolves in time under the influence of its own internal dynamics and because of external forcings such as volcanic eruptions, solar variations and anthropogenic forcings such as the changing composition of the atmosphere and land use change. That seems to be the case. 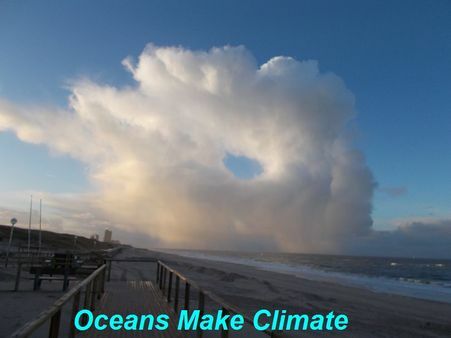 A science which is not able to define the central terms they use: weather and climate, and is unable to name the oceans as the most potential driver of atmospheric processes, will fail to advise politics and the public fair, competent, correct, and thoroughly. for any sound scientific work. This is obviously the decade in which climate is coming into its own. You hardly heard the word professionally in the 1940s. It was a layman's word. Climatologists were the halt and the lame. And as for the climatologists in public service, in the British service you actually, had to be medically disabled in order to get into the climatologically division! Climatology was a menial occupation that came on the pecking scale somewhat below the advertising profession. It was clearly not the age of climate. Spencer Weart, 2007, “The Discovery of Global Warming”: Chapter: Climatology as a Profession; http://www.aip.org/history/climate . Available as book: HARVARD UNIV. PRESS, 2003. __At the middle of the 20th century the study of climate was a scientific backwater. People who called themselves “climatologists” were mostly drudges who compiled statistics about weather conditions in regions of interest—the average temperatures, extremes of rainfall, and so forth. It is a pity. 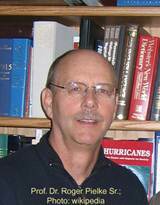 Prof. Roger Pielke Sr ended to run his invaluable weblog “Climate Science: Roger Pielke Sr.“ on November 13, 2012, which he had started with a post on the topic “What is Climate? 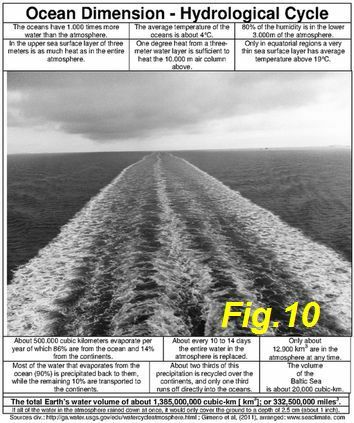 Why Does it Matter How We Define Climate?” on July 11, 2005. We discussed his consideration critical in 2007 (here B-211; and B-330). He, as well as his son Roger Pielke Jr. (here E-510), belong to the very few scientists that have addressed the climate definition issue critical. In the last seven years R. Pielke Sr. did it frequently. 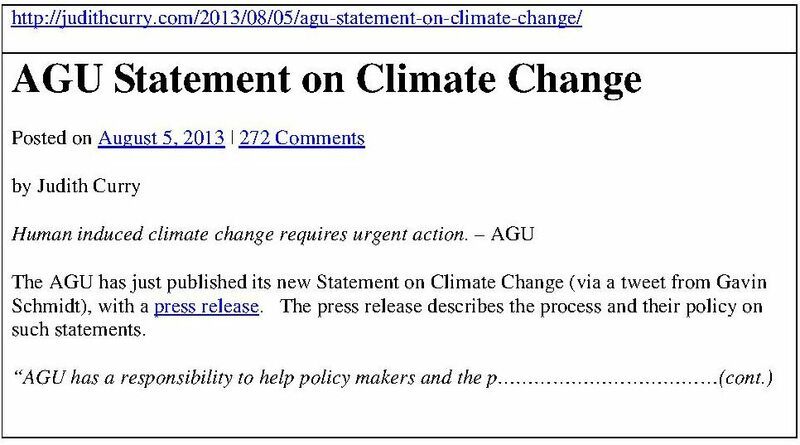 In a post on June 15, 2012 (HERE) he commended once again: “The terminology in the field of climate and environmental science is filled with jargon words and the misuse of definitions.” Particularly he opposes the term “climate change”, because the term is being extensively used to mean “anthropogenic caused changes in climate” from nearly ”static“ climatic conditions. Instead only the term “climate” or “climate system” should be used, concluding that the post shall “alert others to the frequent mischaracterization of the climate system”. Regrettably his considerations lack even basic clarity and do not end the mischief in the disastrous climate terminology. Nothing is solved if “climate change” is replaced by “climate system”. It would require saying precisely and in a meaningful way what “climate” is. 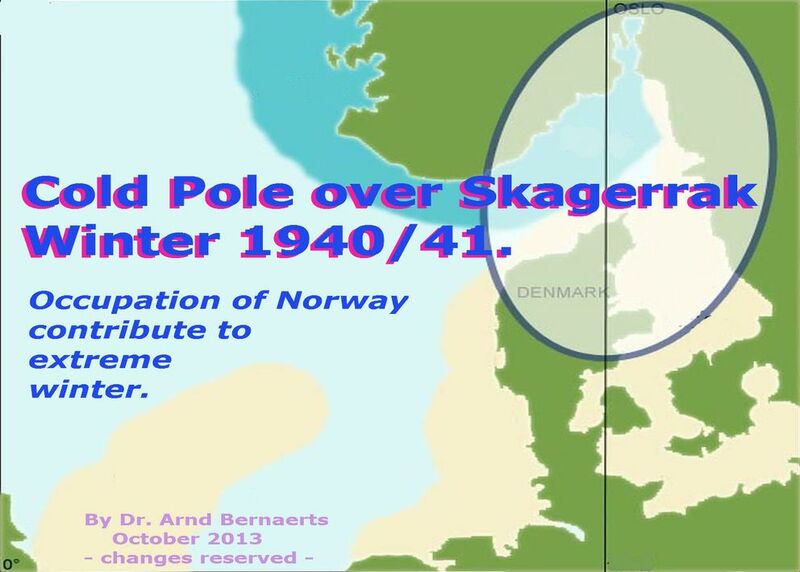 Back in 2005 Roger Pielke Sr. assumed in his first post (see above) that “the climate is the system consisting of the atmosphere, hydrosphere, lithosphere, and biosphere”. Later he merely presented it more detailed definition without altering the basics. The definition is meaningless. It explains nothing. Beside from not mentioning the fundamental relevance of sun ray, “weather” can either be defined as: a system consisting of the atmosphere, hydrosphere, lithosphere, and biosphere. In the same way “nature” can be defined. If weather, climate, nature, need or can only be defined in the same way, than it is misleading to use different words, but claim that there is a distinction. Nevertheless one can often read: “weather is not the same as climate”. That is talking rubbish. 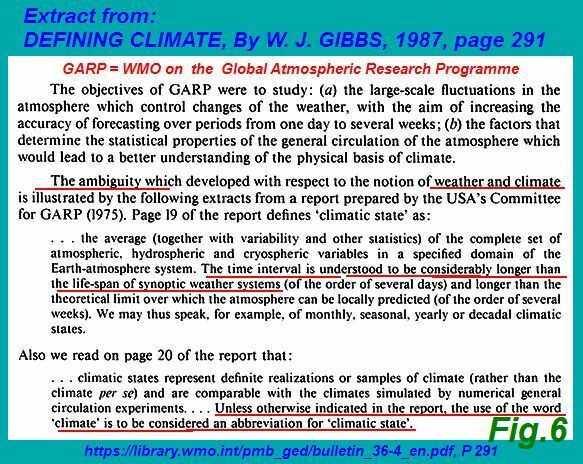 The starting point is that “climate” is generally defined as average weather (by WMO and others) without defining “weather” in the first place (discussed HERE and HERE). It is a comparison between apples and pears. One item has a physical background; the other item is a ‘man-made’ technical mean, which we know as “statistic”. 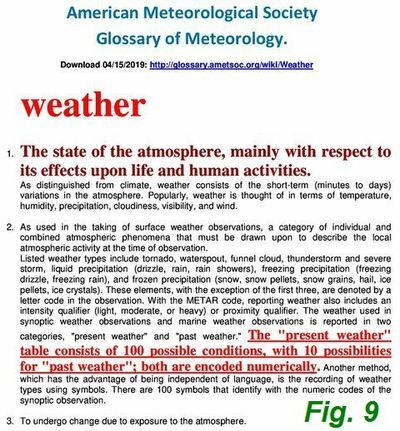 “Weather” consists of many dozen components (AMS-Glossary), which can be described in many hundred ways (see HERE). The statistic of single physical element, or specification of atmospheric behaviour, remain an abstract mean. Phrases such as “changes in regional and global climate statistic” could be used. This assumption is wrong. Regardless what kind of regional or global weather statistics is at stake, it is necessary to name the “specific component” individually and precisely. Assuming that one or several statistical components are able to make-up a weather or a nature “system consisting of the atmosphere, hydrosphere, lithosphere, and biosphere” would always result in a failure. “Climate” is a meaningless term, and scientifically incomprehensive in what ever combination with other words. as published by Judith Curry on August 5, 2013.
land surface and cryosphere), including both the mean state and any variations over time. · Climate change is defined as a shift in the statistical description of climate." A statistic is a statistic of the ‘element’ in question. To say climate is the “statistical description of all elements in the climate system” is circularity, obscure and explains nothing. 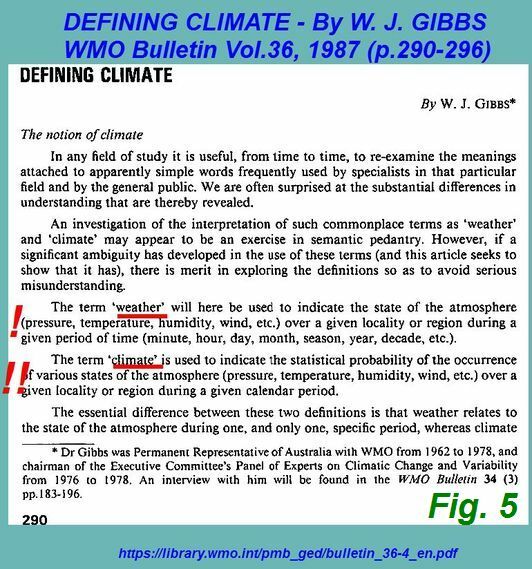 The common explanation “climate is average (statistical) weather” is scientifically meaningless, if “weather” is not defined in the first place. Circumventing the problem “weather” by replacing it with indefinite “elements” (which can be several thousands) solves nothing. The collection, organization, analysis, interpretation and presentation of data (http://en.wikipedia.org/wiki/Statistics ) from the atmosphere, ocean, land surface and cryosphere does neither represents: weather or climate. 7. 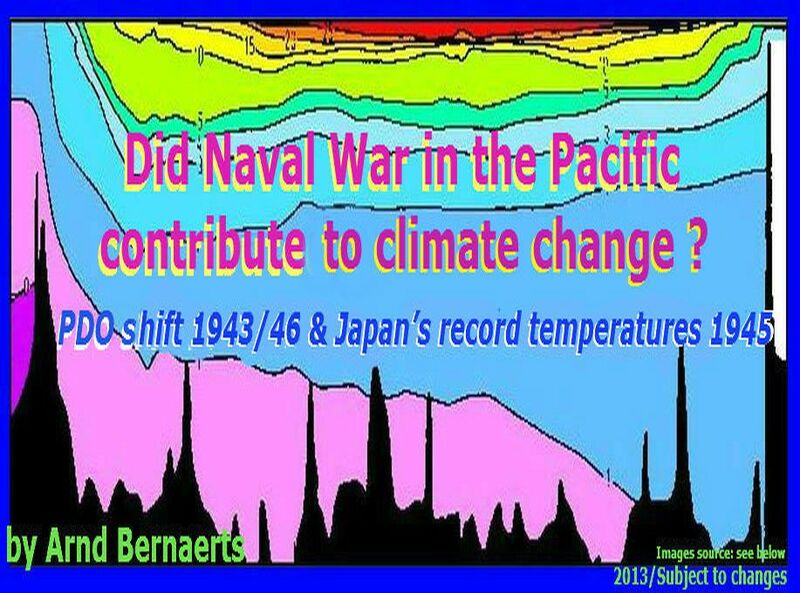 Did Naval War in the Pacific contribute to climate change? 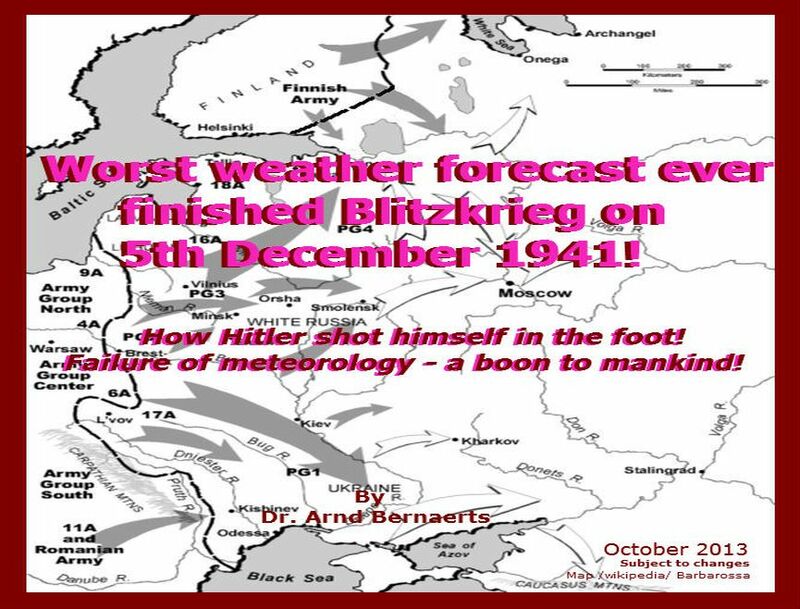 Not knowing the reason for the biggest climatic shift since industrialization, which started in winter 1939/40, rectifies to speak about failures of meteorology. 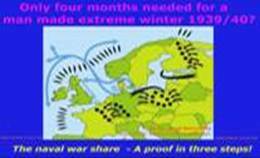 Only four months into Second World War Northern Europe experienced the coldest winter in 100 years. The reason: plain physics! 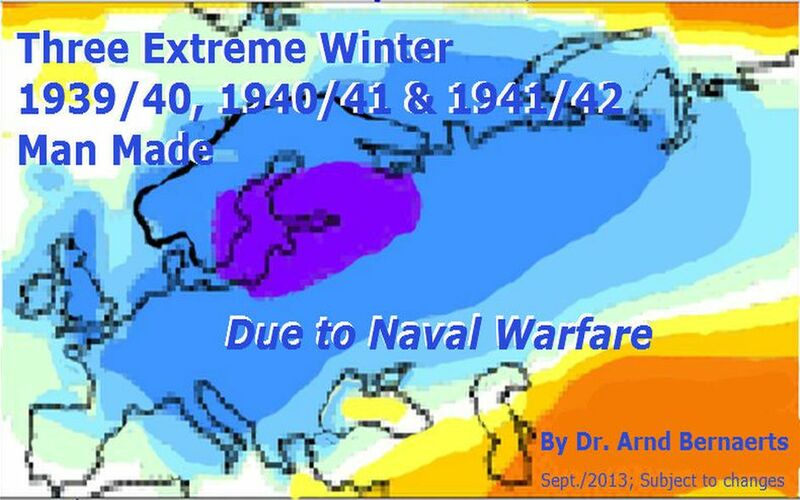 Naval war in Northern European seas released the summer heat too quickly. Polar air got free access to Europe . The same applies to the second and third war winter. Europe was back in the Little Ice Age. After Japan attacked Pearl Harbor on Dec. 7th, 1941 naval war became a global affair. 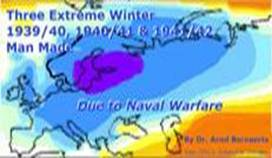 In close conformity with naval war in European seas, and subsequently in the Pacific, a pronounced global cooling took place, which lasted until about the mid 1970s. 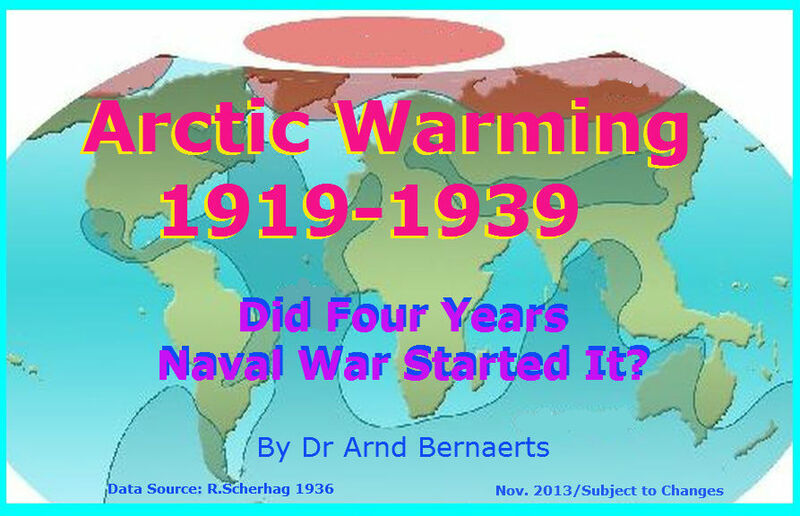 Furthermore, a thorough research of strong warming in the Northern Hemisphere from winter 1918/19 to winter 1939/40 would have revealed a convincing link to naval war in Europe from 1914 to 1918. 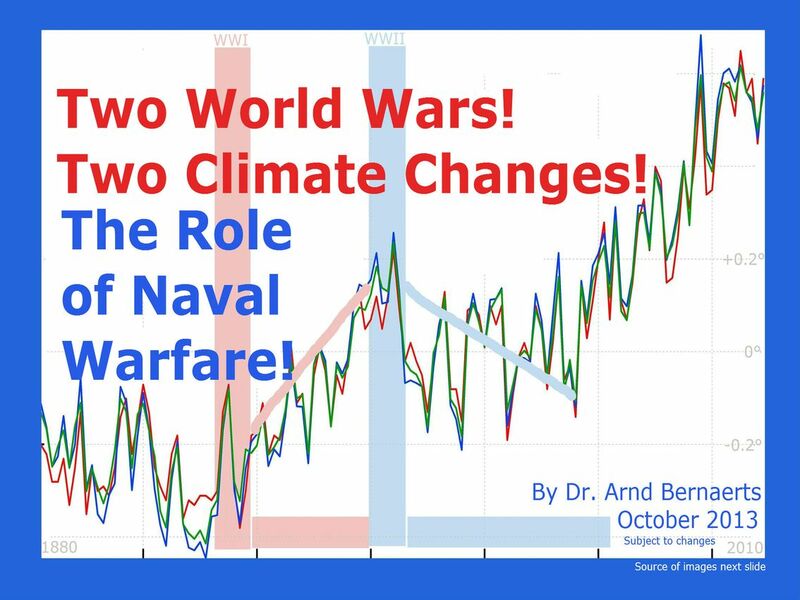 Claims to understand climate should be regarded as a failure as long as meteorology is unable to explain the two most pronounced climatic shifts during the last century and the role two world wars had in this game. 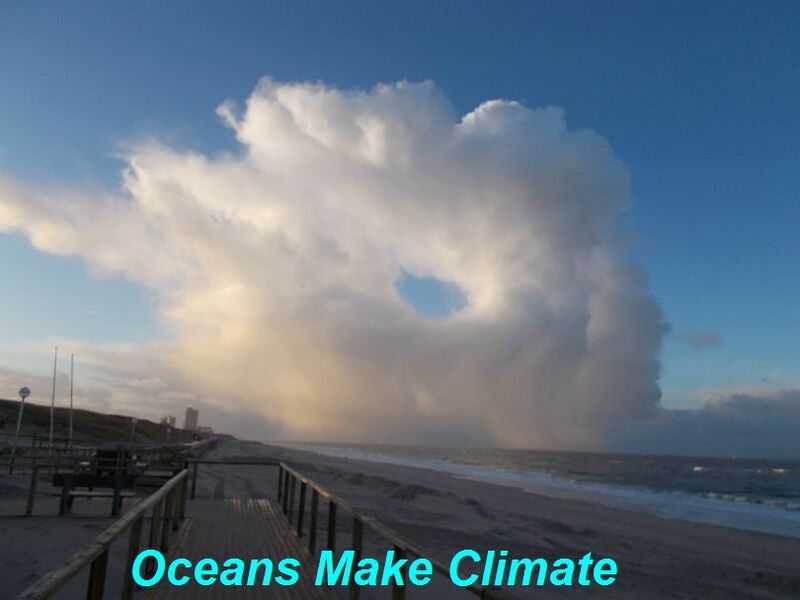 These two events would show that the oceans have a dominate role in the climate system, and man is able to change its direction by intensive activities in the marine environment. 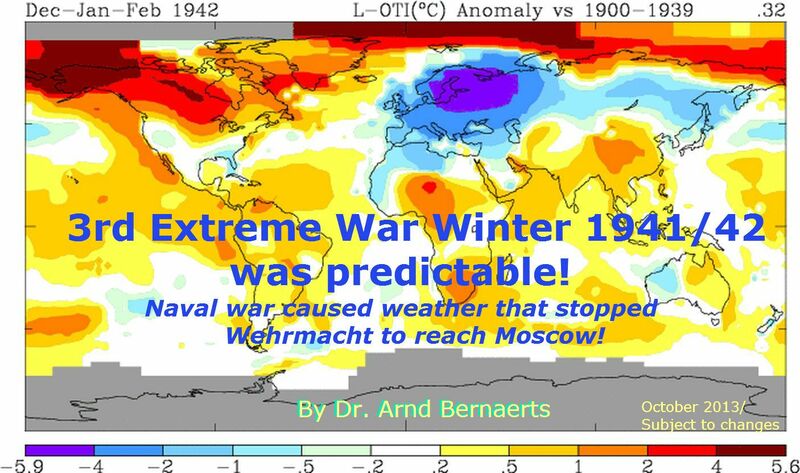 It took four months to generate the extreme regional winter 1939/40; and subsequently a few years to contribute to global cooling lasting for three. 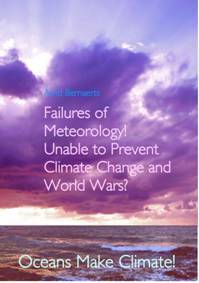 The book should alter the debate on climate change! only in b/w if manufactured outside Europe . 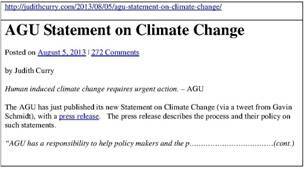 206 IPCC says that there are important differences between weather and climate. Is the claim serious science? 305_ What is Weather? Is 'average weather' climate? 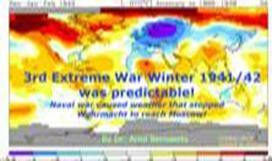 315_ How did Thomas A. Blair describe in 1942: Weather, Climate and Climatology?